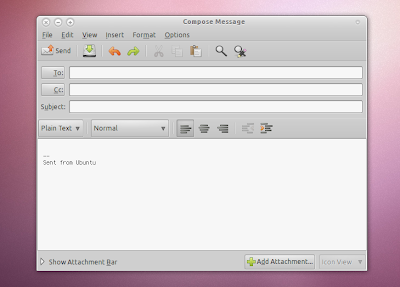 Reading the Ubuntu Planet today, I came across a post which mentions a new "feature" that is going to be in Ubuntu 10.10 Maverick Meerkat: Evolution, the default Ubuntu email client will automatically add a "Sent from Ubuntu" signature to the emails you send. "Sent from my iPhone", "Sent via BlackBerry", "Sent from Ubuntu"
If you ever got an email from someone using an iPhone, BlackBerry and so on, you probably noticed it uses such a default signature. While it makes sense (well, almost) to use such a signature on a mobile device as an excuse for typos, this isn't the case for Ubuntu - at least not for the Desktop edition in any way. There's also a funny thing about this feature. A bug was filled to ask for "Sent from Ubuntu" default signature in Evolution and when another bug was filled not to implement this feature (the opposite of the first bug), it was marked as a duplicate of the first one. Update: "Sent from Ubuntu" has been the default signature in Evolution since 2010-08-27 but you'll only notice it if you didn't set up your own signature (the new signature doesn't replace your custom one). If this was to increase the Ubuntu popularity, I would agree using such a signature. But will such a signature help Ubuntu get more popular or is it just annoying? Update: the "Sent from Ubuntu" default email signature for Evolution in Ubuntu 10.10 has just been removed - as you can see in the latest Evolution package changelog. Thanks to LucidFox for the info!